LOCATION: Tsuru Sushi, various locations [see website for details]. BREAD: Sesame seeded brioche bun. FILLING: Karaage chicken, cos lettuce, Japanese mayo. PROS: What do you mean you don’t know what karaage is? Are you some kind of IMBECILE? Okay fine so it’s Japanese fried chicken. Fried chicken is now officially a good thing, by the way. No longer do we have to scarf KFC or Morley’s on the down low for fear of being ostracised by friends and family, now we can go to places like Wishbone, Mama Lan’s and Tsuru, and eat really bloody good fried chicken. We can eat it inside while sitting down and everything, rather than loitering with it on the streets or worse – YOUTHS – on the bus. No. Do you know what is covering the roofs of most buildings in major cities like London? Chicken bones, that’s what. The kids throw them on the floor and pigeons pick them up and deposit them on the roofs of buildings. Anyway. This sandwich is incredibly good. Firstly, the chicken is thigh meat, which we all know is much tastier, not to mention juicier, than breast. It’s marinated in mirin, soy, ginger and garlic, then given a good ol’ dustin’ in cornflour and deep fried. It is spectacular; greaseless and, importantly, craggy. A good craggy batter is where it’s at. It comes on a sesame seeded slightly sweet bun, which is golden and shiny and has your back right until the end. There’s cos lettuce and Japanese mayo. You don’t know what Japanese mayo is?! Okay so it’s made with rice vinegar and is a little sweeter than the regular kind. 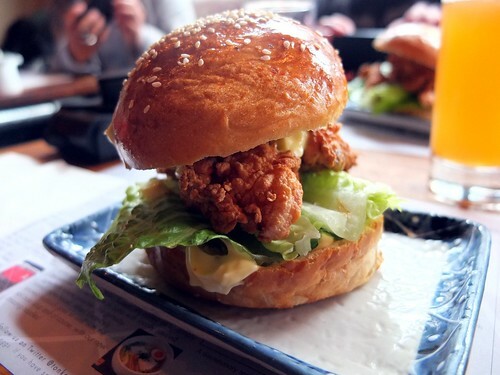 Now here’s the deal with the karaage sandwich; it’s delicious as is and all but the thing you need to remember is to add copious amounts of Tsuru’s frankly fantastic ‘Eat the Bits’ chilli oil. It’s quite mild for chilli oil actually, but the flavour is incredible. The way to use it is to get plenty of the sediment at the bottom, hence the name ‘eat the bits’; it’s packed with sesame, red miso, garlic and onion. Get it on there, basically. Also, buy a couple of pots to use at home. CONS: I would say the chilli oil should come as standard but it’s nice to be able to control how much you put on. Perhaps it should come with a little bit, just to convert any non-believers. I also find myself wondering if the lettuce should be shredded. Perhaps not.